Last time when I shared the super-actionable post, How to Analyze Financial Health of a Company in 6 Easy Steps, I got emails from readers asking for how to build a revenue model. So, I decided to write not ONE but FOUR approaches to revenue modeling and take a real case in retail industry. How The retail business is one of the largest and most diversified sectors covering a very broad range of products from clothing and footwear to appliances/electronics and home-related accessories. In this article we will walk through the different terminologies that are used in the financial statements of a retail company, which will help you understand the business performance of the company. We will then take a case example of retailer and understand its revenue model to forecast the revenue for future periods. EOP Number of Stores: This includes total number of stores (both company and franchisee-operated). It is a quick indication of the magnitude of the company’s operations. Average Number of Stores: This indicates average of the number of stores in operation over the course of the given period. Net New Store Opened: This indicates number of net new stores (store opened – store closed) opened in a period. EOP Selling Area (unit: Square Footage): This refers to the total area (in square footage) at the end of the given period (excludes the square footage used to house inventory). Average Selling Area: This indicates average square footage area over the course of the given period. Sales per Average Store: This measures the amount of sales generated per average store for the given period. It helps determine the productivity of the store. Sales per Average Area: It is calculated by dividing a company's sales by average selling area of its stores. Total Sales: This measures total sales made by selling products and services to the consumers from all stores in operation. Comparable Store Sales: This is sales from stores that have been in business for more than one year. It is also termed as Same Store Sales or Comp Sales or Comps in retail industry. New Store Sales: This measures the sales generated by stores that have been opened during last one year. New Store Productivity: This measures the sales generation efficiency of new stores. It is calculated as New Store Sales divided by increase in Area of New Stores added during last one year. To explain the Comparable Store Sales, New Store Sales and New Store Productivity, let us take an example of retail firm which had 100 stores at the end of 2013 and opened 10 new stores in 2014. So, the company had 110 stores at the end of 2014. Now, let us assume that the total sales of the company was $1000 million in 2013 and $1200 million in 2014. So the company's sales increased by $200 million in 2014. 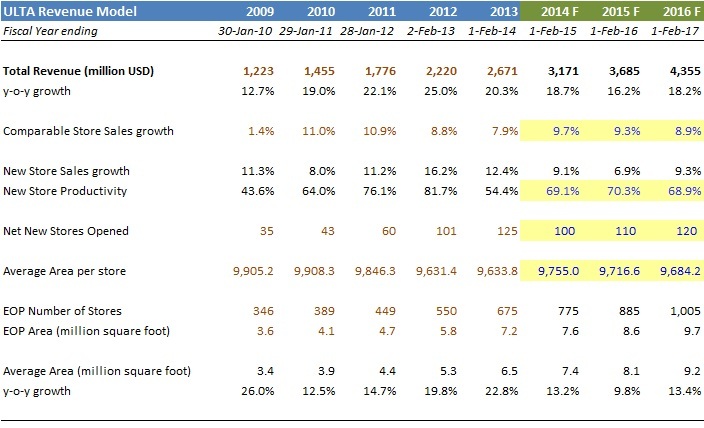 Now, suppose the company generated $160 million (or 16%) from old 100 stores and $40 (or 4%) million from new 10 stores. So, in the above example, the Comparable Store Sales is $160 million and Comparable Store Sales growth is 16%– generated from stores that have been in business for more than one year. Remember, that the 10 new stores were opened in 2014 and have not been in business for more than one year. New Store Sales is $40 million and New Store Sales growth is 4% –generated from stores that were opened in last one year. Now, let us assume that the selling area of stores increased by 5% from the addition of 10 new stores. So, the New Store Productivity is 80%(= 4%/5%), which is calculated as New Store Sales in percentage / Increase in Area of New Stores in percentage). Now that you have become familiar with the terminologies used in the financial statement of the retail companies, we will discuss four approaches that are generally used to forecast Revenues of companies in retail sector. We will take case example of ULTA Beauty (NASDAQ: ULTA) to explain the four approaches. ULTA is the largest beauty retailer in the United States and the premier beauty destination for cosmetics, fragrance, skin, hair care products and salon services. In the case example, I have taken the historical numbers from the Annual Reports of the company. You can download the reports from www.ulta.com -> Investor Relations -> Financial Performance. Revenues growth: Growth of Revenues for forecasted periods is assumed based on the historical trend and future guidance (qualitative or quantitative) provided by the management of the company. In the example, I have made assumption on Revenue growth (y-o-y) for forecasted period based on average of revenue growth of last four years (after recessionary period). Numbers of new stores: Number of new stores for forecasted periods is assumed based on management guidance/indication to open new stores in future periods. In the example, I have made assumption on Number of net new store opened in future years based on historical trend and after reading the management guidance. 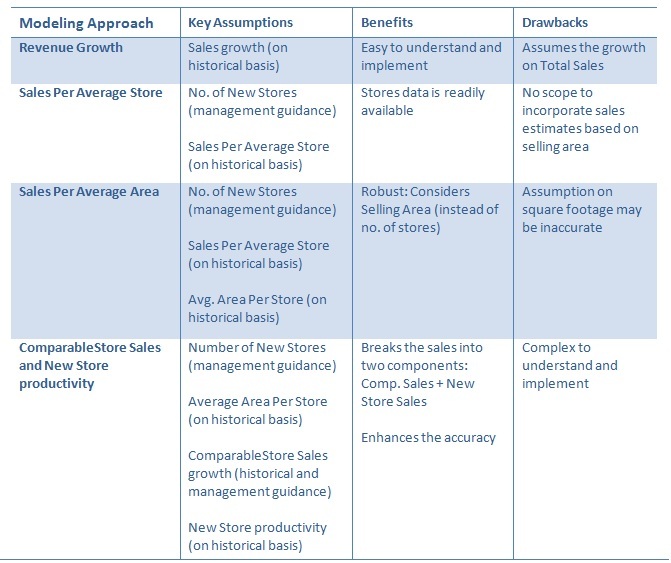 Management guidance for “Number of Net New Stores” is given on Page-4 of Annual Report (refer to Figure 2). You can refer to other company filings such as quarterly reports and investor presentations to seek management guidance on other items. Sales per Average Store: Sales per average store for forecasted periods is assumed based on historical trend (constant). In the example, I have made assumption on sales per average store for forecasted periods based on average of Sales per Average Store of last four years. Average Area per store: Average area per store for forecasted periods is assumed based on historical trend (constant). In the example, I have made assumption on Average Area per Store for forecasted periods based on average of Average Area per Store of last four years. Sales per Average Area: Sales per average area for forecasted periods is assumed based on historical trend (constant). In the example, I have made assumption on Sales per Average Area for forecasted periods based on average of Sales per Average Area of last four years. The benefit of this approach is that the revenue is broken into its sub parts: Comp Store Sales and New Store Sales. The Comparable Store Sales, which is the majority portion (80-90%) of the total revenues, is forecasted on the basis of how the sales will grow if there were no new store addition in the company business. This growth would generally be in line with historical comparable store sales growth and economic growth. The New Store Sales is forecasted on the basis of how much productivity a new store generates in its first year of opening. The productivity for forecasted period is assumed to be in line with the historical trend/constant for the future periods. Please note that the sales of a store is counted in the comparable store sales its first year of operation. Comparable Store Sales growth: Comparable Store Sale growth for forecasted periods is assumed based on historical trend and management guidance/economic scenario for future. In the example, I have made assumption on Comparable Store Sales growth for forecasted periods based on average of Comparable Store Sales growth of last four years. New Store Productivity: New Store productivity for forecasted periods is assumed based on historical trend (constant). In the example, I have made assumption on New Store Productivity for forecasted periods based on average of New Store Productivity of last four years. Now it’s time to actually put these powerful approaches into practice. To make the process easy for you, I made the comparison above that outlines the EXACT approach you need to select.